I use this every day. I have it programmed so coffee is ready in the morning. The coffee wo stay warm in pot got about 10 hours. I bought this coffee maker for our office, and I love it! I like that it is reliable when you program it, and it keeps the coffee hot for hours. I wish it had a bit of a larger pot, but otherwise it's a great appliance! For the price this is great. 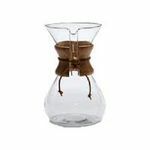 I was looking for a carafe coffee pot so I could enjoy all morning long without burning the coffee. It does just that and doesn't get grounds in my coffee or drip on my counter. This coffee maker is great. You have a removable water container that holds the water. The coffee funnel is also removable. You fill up the water tank and put on the machine. You put the coffee grinds in the funnel and install that. Then you put the coffee pot in its position and the coffee filters into the carafe. The carafe is insulated and completely sealed and spill proof. It keeps your coffee warm for several hours. The best part is that there is no hot burner that is cooking the coffee continuously. The coffee pot turns itself off after the coffee has brewed. I like this because it is not breakable and safe around children. Great tasting coffee all day long. I've had this coffeemaker about a year now. It has it's pros and it's cons. I can honestly say that we have used it daily and several times a day. My husband is a coffee addict. It's a very sturdy machine and it's very appealing. 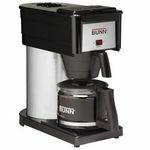 I'll go into what I like and what I don't Likes- it has a nice sturdy handle It's very easy to clean It has an analog clock display that's bright You can choose a strong or regular brew It has several temperature settings. I like my coffee warm and my husband likes it super hot. This is a great feature. I also like the delay brew feature. I set it at night and the coffee is ready when I wake up. One less thing to worry about. It even has an alarm. So, these are all the features I like. The features I dislike are few. For one, the water reservoir is a little narrow. Pouring the water from the side caused me to spill it many times. Maybe I'm just clumsy. Also it tends to leak and I can hear it falling onto the burner. It's not a large amount, but it caused the burner to start peeling. Last, the top on the carafe broke and it was hard to pour into the cup without it leaking. I really don't find use for the filter. If you don't push the filter in completely your brew comes out weak. All in all, it's lasted a long time for as much as we've used it. It just has it's quirks. I use this coffee pot everyday. All day. I love the taste of the coffee. It has a water filter and tells you when to clean your pot and does it for you. 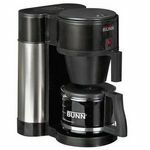 It is the best coffee pot I have every owned. Easy to use....Coffee has no flavor! Overall, the ease to set the programming was easy. I liked the removable water tank. The only thing was I didn't like the flavor of the coffee. I truly believe coffee taste best in glass. This has no glass liner inside the thermal. For that reason, I returned it. Brew Performance It brews quickly, in about 7 minutes you have a full pot. It has a filter to keep the chlorine and other chemicals out of your coffee. The only problem...which is a big problem to me, is the flavor. Coffee taste best when it is in glass. It is sad that they didn't put a glass liner inside the thermal container. The metallic makes the coffees flavor poor. This isn't just me, I have some friends over and I asked them, they all agreed...glass. Ease of Cleaning You just rinse out the thermal container, remove and rinse the filter holder....and it's good to go. Ease of Use It is pretty easy to use. I love the removable water container! Makes it so easy instead of pouring into coffeemaker Design I really like the design! Very pretty on the counter. Buttons are easy to see and use. It's beeping gets annoying though. LED light looks nice and bright in the dark Durability I really can't comment much on this since I returned it due to the flavor, or lack of, of the coffee. It seems pretty durable. 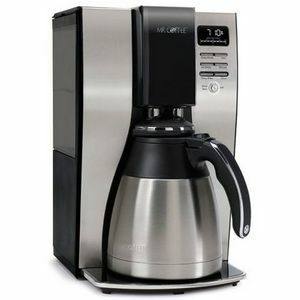 We have the Mr. Coffee 10-Cup Optimal Brew Thermal Coffee Maker at the office, and it is a wonderful machine! The convenience of not having to buy and use a coffee filter is so nice, and makes it very easy to use. The water basin is easy to remove and put back, and the machine brews a great cup of coffee. Plus its sleek design makes it an attractive piece in the office! Our family goes through a lot of coffee. We have had different models and this is by far my favorite. It keeps the coffee warm for 12+ hours and the tank is removable so you don't have to worry about spilling the water as you are trying to fill it up. Brew Performance I noticed the difference in the flavor of the coffee. Ease of Cleaning Simple vinegar. Just let everything air out over night and the smell will go away. Ease of Use Everything pulls apart from the machine. I have never had any problems Durability Had if for 3 years. I love this coffee maker. I have tried everything from Bunn to Black and Decker and everything in between. 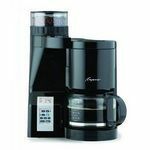 Finally, I purchased this Mr. Coffee ten cup thermal coffee maker. I love it becasue I can program it at night, and my coffee is hot and ready in the morning. I have not had any problems with it. Brew Performance This coffee maker brews to perfection. The coffee is hot, just the way I like it. I like that it is a thermal pitcher, which keeps the coffee warmer longer. Ease of Cleaning I clean this by hand washing the basket that holds the ground coffee with warm soapy water and a soft brush. I do the same with the pitcher, except I use a cloth. 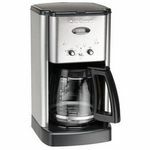 Vinegar is good to run through a few times to clean the inside of the coffee maker. Just remember to run hot water through it a few times after using the vinegar. I only do that 2-4 times a year. Ease of Use I love that the water container is clear, and you can pour the water right into it to see how much you want to use. It is also removable for easy fill up or cleaning. Design No complaints! It looks nice and works well. Durability So far, so good! It has held up nicely, and I drink plenty of coffee throughout the day!